(Press release) On September 22, 2015, Junior League of Dallas (JLD) members, sponsors and donors gathered at Museum Tower for the highly anticipated announcement of the theme and entertainment for the 54th Annual Junior League of Dallas Ball, presented by Sewell, set for Saturday, February 20, 2016, at the Hilton Anatole Hotel. 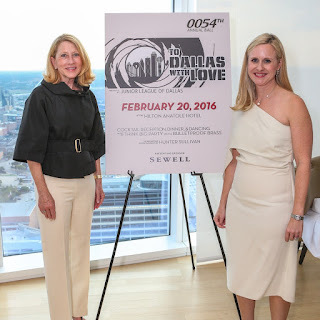 JLD Ball Chair Ashley Allen, along with Honorary Ball Chair Debbie Oates, revealed the theme, To Dallas With Love, which is inspired by James Bond. Tom Addis Productions will bring James Bond to life for guests and create the exciting 007 inspired evening, which will also feature a fantastic big board silent auction. This year, the annual JLD Ball will feature three entertainers throughout the evening. Dallas-based singer/songwriter/band leader Hunter Sullivan and his trio will kick things off during the VIP sponsor reception. Together, they have built a solid reputation as the go-to source for authentic presentation of the best in Great American Songbook, classic pop and romantic ballads. During dinner, guests will enjoy the sounds of the Lone Star Wind Orchestra, a 35-piece orchestra comprised of professional wind, brass and percussion players. Following dinner, patrons will be on their feet and out on the dance floor with the upbeat, high-energy music from Think Big Party with the Bulletproof Brass Band. For individual tickets or sponsorship opportunities, please visit www.jld.net or contact the JLD Development Office at 214-357-8822, ext. 118, for more information.